Mike Chau was born in Hong Kong and studied with Wu See-Lok (Former Principal Violist of Hong Kong Philharmonic Orchestra and Hong Kong Sinfonietta), Michael Ma (Former Concert Master of Hong Kong Philharmonic Orchestra and current String Department Head of HKAPA) and Patricia McCarty (Former Principal Violist of Boston Symphony Orchestra). He received his Diploma in Music Performance from the Hong Kong Academy for Performing Arts, a Performance Certificate from the Boston Conservatory of Music and his Licentiate (LTCL) and Fellowship (FTCL) Diplomas in Performance from the Trinity College of London. He is active on the local music scene giving regular solo recitals and chamber music performances. In 2007 he played the Stamitz viola concerto with the Union Philharmonic Orchestra. 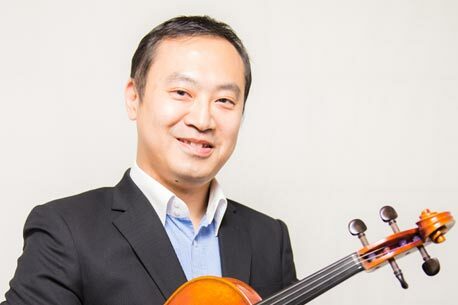 He has appeared with many local and overseas orchestras including the Asian Youth Orchestra and the Boston Conservatory Orchestra where he served as the principal violist from 1996 to 1998. Mike is currently a founding member and principal violist of the City Chamber Orchestra of Hong Kong in 2006-2012. He has also appeared as a guest player of the Hong Kong Philharmonic Orchestra, Hong Kong Sinfonietta and the Macau Orchestra.